What are the top landmarks in Capri? This beautiful bay sits at the base of Capri’s tallest peak and has impressive sea views and some of the island’s best beaches. Enjoy a stop at Via Krupp, a landmark worth seeing in Capri. Amble around the area's marina or seek out the local tours. Explore the lovely green spaces of Arco Naturale and enjoy the boating in Capri. Stroll along the marina or seek out the local tours. 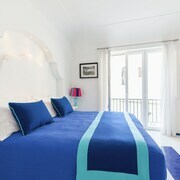 Lovely property the the heart of Capri shopping and restaurants. Sits up high over the street with lovely view from our balcony. Nice breakfast with staff who make good coffees. Helpful staff at the front desk. Huge room and bathroom . 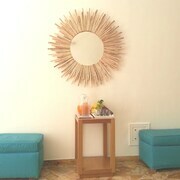 Nice amenities in bathroom. Old school style. Beautiful property with a nice view. The only problem is hauling luggage to the hotel. Passenger vehicles cannot drive up to the hotel. The nearest taxi stop is about a 10-minute walk from the hotel. You can pay to have your bags transported to/from the hotel to the taxi stop for 4-5 dollars a bag. An island so beautiful that it captivated ancient emperors, Capri makes for an essential day-trip from Naples or Sorrento; if you’d rather stay a while in this glittering Mediterranean gem, there are a host of Capri hotels standing by to showcase the hidden depths of this seaside paradise. This rocky island has been a resort since Roman times. It’s thought to have been initially developed by Augustus, the first emperor of Rome, and it later became a favourite of Tiberius, who made Villa Jovis his permanent residence for several years. The ruins of his villa can still be seen outside the main town, although many other notable archaeological sites around the island were destroyed during the 19th century, when Capri was used as a British military base. Interest in Capri as a holiday destination was really spurred when the Blue Grotto was rediscovered by a couple of German tourists. This sea cave was once used as Tiberius’ swimming pool and bath, and boat trips through it are now the island’s principle visitor attraction. Past visitors to Capri have included Queen Victoria, Claude Débussy, Mark Twain and even the Russian revolutionary Lenin. Capri lies in the southern Bay of Naples, in the Tyrrhenian sea. It can be reached quickly and easily from Naples and Sorrento by both ferry and hydrofoil, while smaller boats often arrive at the Marina Grande, from where a funicular carries visitors up to the town of Capri. 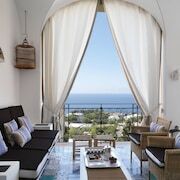 There are 2 options when it comes to hotels in Capri – establishments in the town’s charming centre or properties in Anacapri, higher up the island’s mountainous landscape. There’s no shortage of reasonably priced offerings in the area, but if you want to make the most of your time on this idyllic isle, you should opt for luxurious properties with sweeping views of the glistening Mediterranean. One such hotel is the Hotel Punta Tragara, where well-furnished rooms come with balconies and terraces, so you can step outside to enjoy scenic sunsets or room service alfresco. 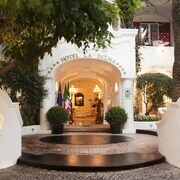 The 4-star Hotel Gatto Bianco is another popular choice, thanks to its proximity to the main piazza. This is the hub of the island’s social calendar and is lined with fantastic restaurants serving all manner of international cuisine. You’ll probably notice many visitors wearing three-quarter length trousers, or ‘capri pants’, which were popularised by Grace Kelly when she visited the island. Getting around Capri is usually done either on foot or using the public bus network, which connects you with most of the island’s main attractions and beaches. This is certainly not an island for cars. The stunning Blue Grotto is at the top of most visitors’ wish lists when they arrive at Capri. So-called because of the illuminations inside, which are formed by the sun’s rays passing through a cavity and reflecting on the water’s surface, the cave is a popular attraction and is easily accessible via regular boat excursions. Some choose to hire their own crafts and then take a refreshing dip late in the afternoon, though guided options offer fascinating local insight. The remains of ancient statues have been found at the bottom of the cave, leading to speculation that it was a marine temple as well as lucky Tiberius’ personal swimming pool. Another must-see location on Capri is the Marina Piccola, which was the harbour used in Roman times. Today it has largely been replaced by the Marina Grande, but there’s still a picturesque beach that offers relative privacy for sunseekers. Capri town is very lively, especially during July and August when the streets and hotels are buzzing with holidaymakers. The pavement cafes in the corners of the magnificent Piazza Umberto I are ideal for watching the world go by over a leisurely cappuccino and, who knows, perhaps spotting a celebrity or two. From Capri you can either walk up the ancient Phoenician Steps, with their astounding views, or take the bus to Anacapri via hairpin bends. It’s slightly more laid-back up here, although still very popular in peak season. 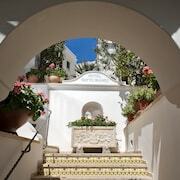 Anacapri landmarks include the 16th-century Santa Sofia Church and the chairlift up to Monte Solaro, which is the highest point on Capri and affords spectacular panoramas. The Belvedere of Tragara is another well-known lookout that makes this a worthwhile journey. Naturally, if you’re staying in a Capri hotel, you can easily make the journey over to the mainland and spend a day in Naples or Sorrento. Both offer plenty of cultural and historic attractions, as well as a wide choice of restaurants and nightlife. Hotels in Naples promise superb value and top-notch facilities, as do properties in Sorrento, if you prefer to stay in the city and simply make a day trip to Capri. Save time and money when arranging your Capri holiday by using the Expedia search tool. 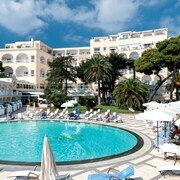 Capri hotels, flights and attractions can all be booked in one place for maximum convenience. Explore Capri with Expedia's Travel Guides to find the best flights, cars, holiday packages and more!